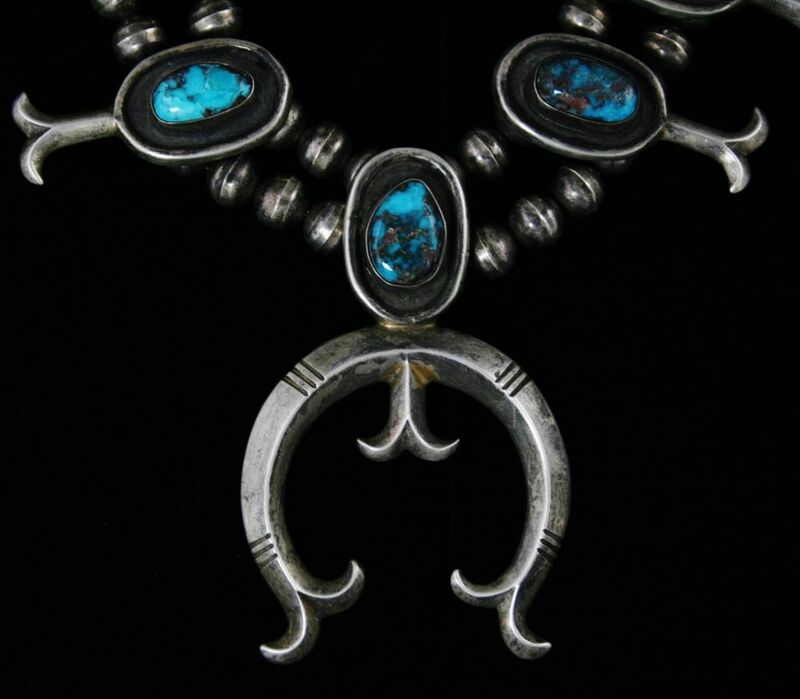 This gorgeous squash blossom necklace is a marvelous example of sand cast jewelry from the 1950-60 era. Each blossom and the naja design was first carved into sand stone then molten silver was poured into the mold to create each piece. The molds are one of a kind and not reusable. The blossoms have a shadow box design that is deeply oxidized. 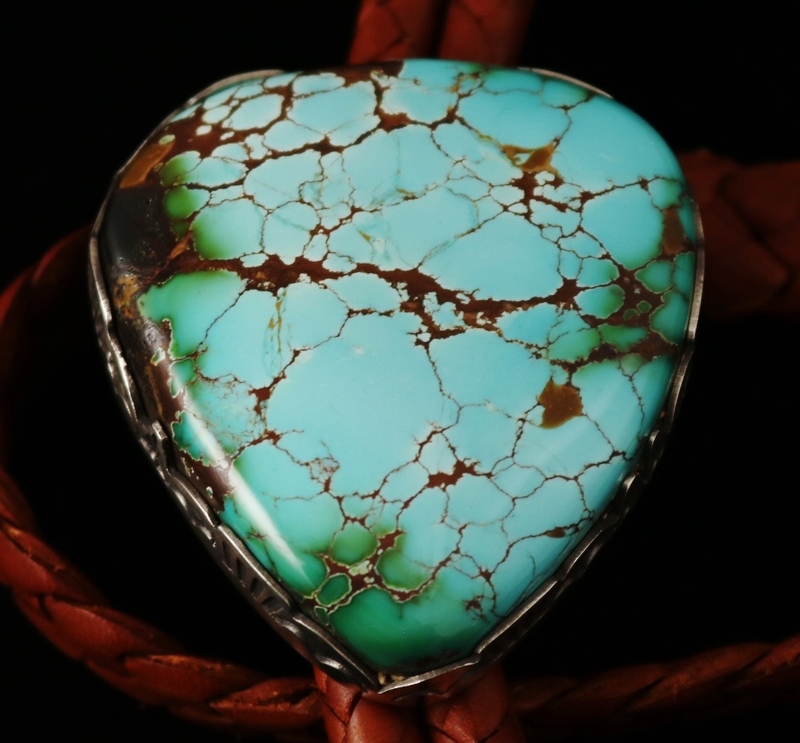 Fine high grade natural Bisbee turquoise is set in each. The deep Bisbee blue gems have reddish brown and purple matrix, the signature look of quality from this classic claim. 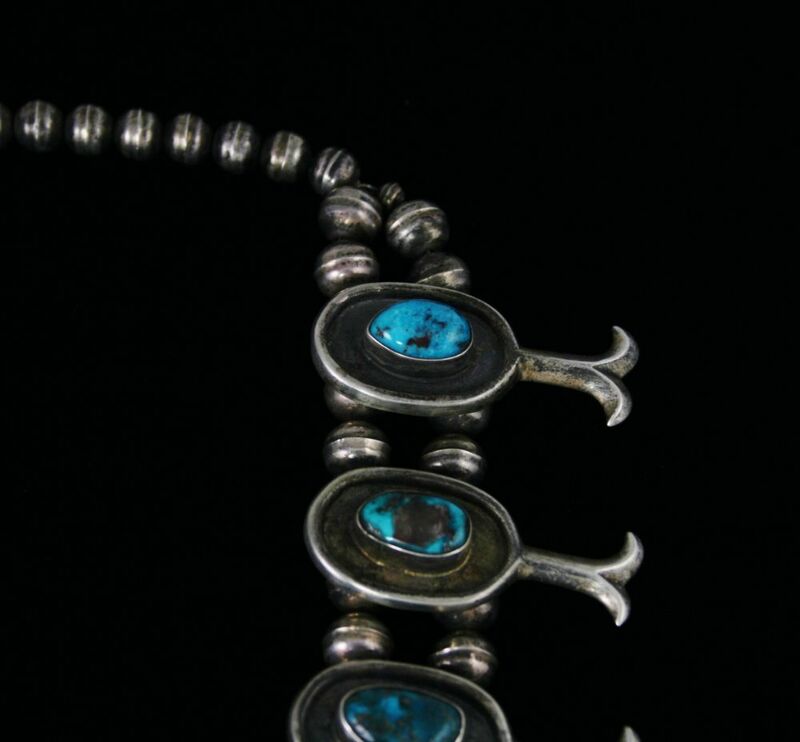 The necklace is strung with hand made beads created on the bench by this mid century Navajo silver smith. Necklace Length: 24-1/4 in. (plus a 2-1/2 in. drop) Naja Size: 3-1/2 in. x 2-1/4 in. (at widest points) Naja Center Stone Size: 11/16 in. x 1/2 in. Avg Blossom Size: 1-7/8 in. x 13/16 in. Avg Blossom Stone Size: 11/16 in. x 7/16 in. 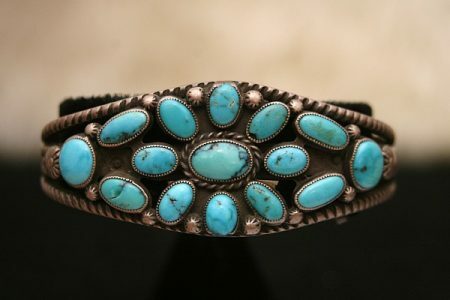 Stunning circa 1940 classic Zuni dot dash row bracelet. 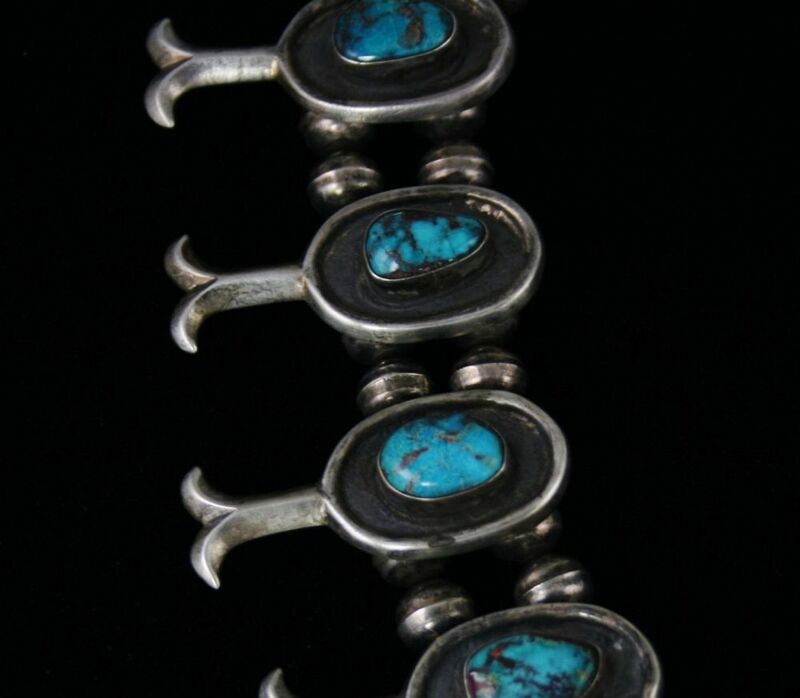 This wonderful piece includes six rows of thirteen artist cut rare gem grade Lone Mountain turquoise cabochons set in beautiful rolled and hammered ingot sterling silver. This item is among the finest known making it of the finest collector quality. 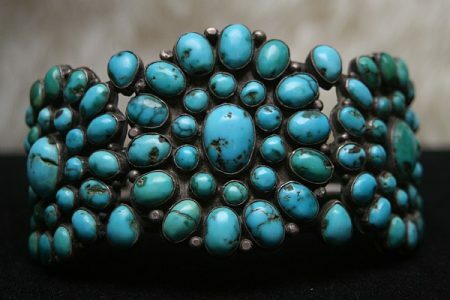 Amazing circa 1940 rare gem grade Blue Gem turquoise six inch jacla with oyster shell tips. The stones are all hand rolled and drilled with beautiful light blue hues and tan and chocolate brown matrix. Smooth to the touch this piece contains a total of one hundred and twelve carats. 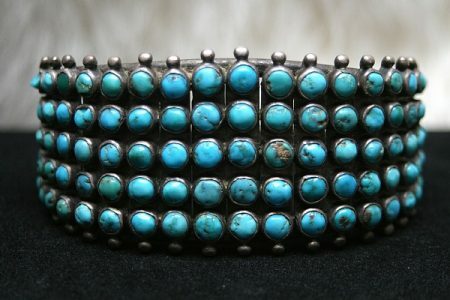 Incredible circa 1930 Navajo rolled and hammered ingot cluster bracelet set with eighty eight artist cut high grade Lone Mountain turquoise cabochons. One of the finest known. 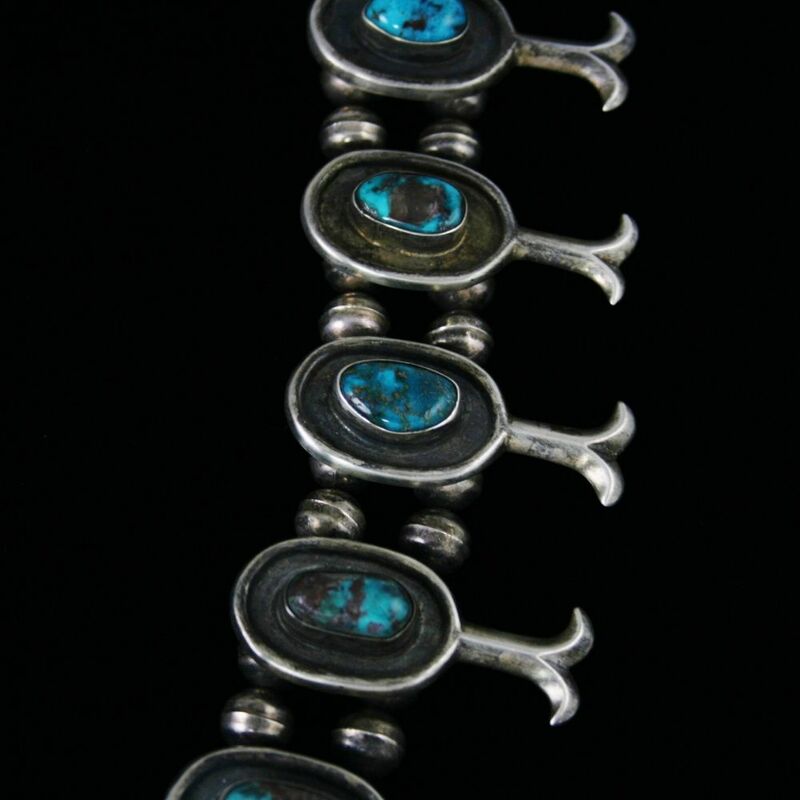 Incredible circa 1920 Navajo rolled and hammered sterling silver ingot row bracelet. 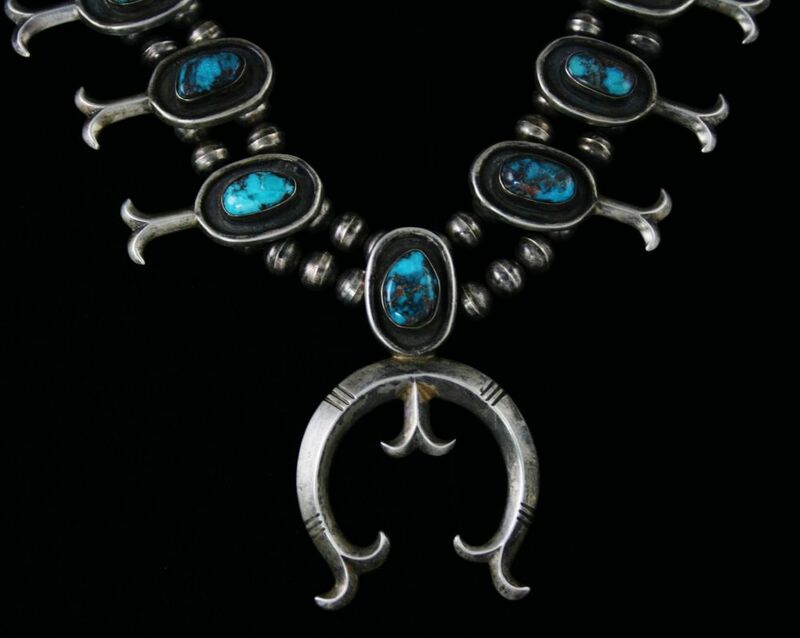 The rows contain a total of ninety artist cut rare gem grade Lone Mountain turquoise cabochons. Each of the stones is a brilliant deep blue with tan and brown matrix. The silver work of the piece is stunning as well with a border of both large and small sterling silver droplets. 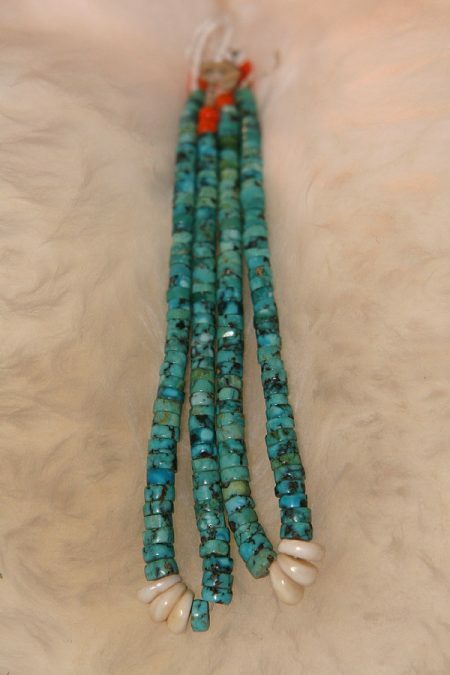 Incredible circa 1940 rare gem grade Lone Mountain turquoise mixed with rare gem grade Number Eight turquoise six inch jacla with oyster shell tips. This stone is absolutely amazing with deep blue to blue-green hues with tan dark blue and chocolate brown matrix. The total carat weight of the piece is one hundred and fifty six. 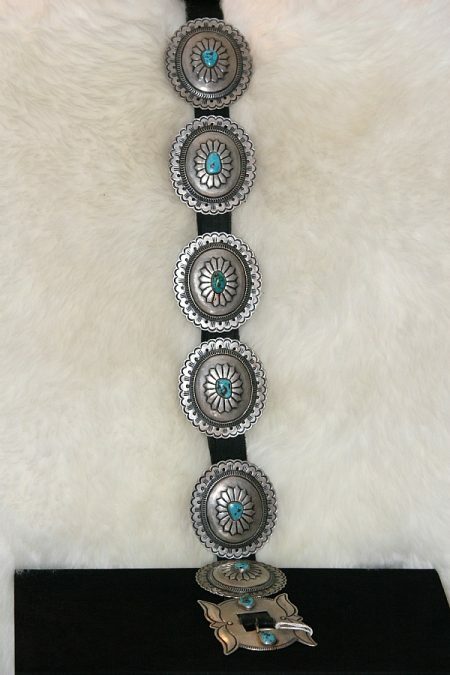 Incredible circa 1920-30 rolled and hammered ingot concho belt set with high grade Godber turquoise. The stone is a gorgeous deep blue with reddish and chocolate brown matrix. This piece includes exceptional detail with crescent shape stamping, small circular cutouts and intricate design. 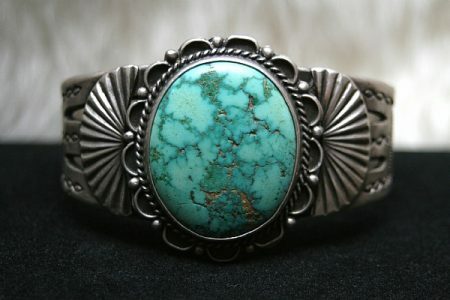 Astounding circa 1940 Zuni cluster bracelet with sixty two rare gem grade Lone Mountain spiderweb turquoise stones set in a floral pattern surrounded with finely crafted ingot sterling silver. This incredible piece is among the finest known. 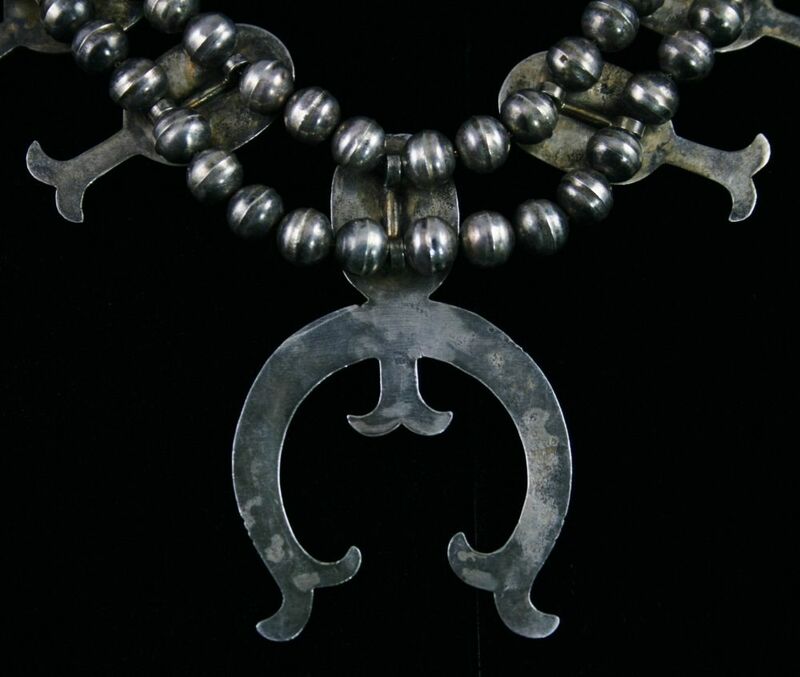 Museum quality Navajo fetish necklace. 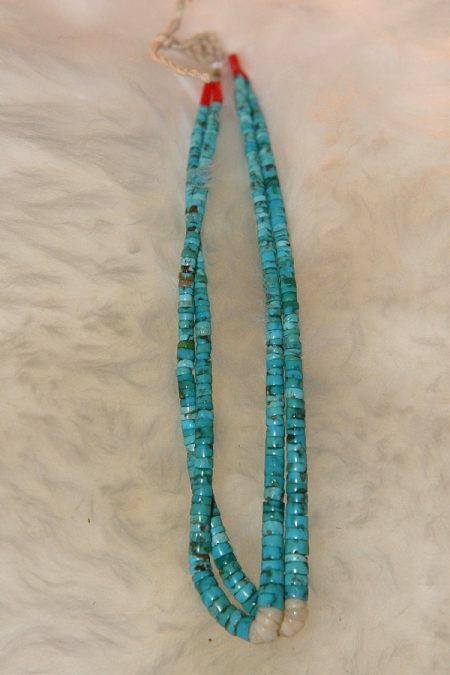 This gorgeous piece is thirty two inches long and is made from the finest natural Royston turquoise. 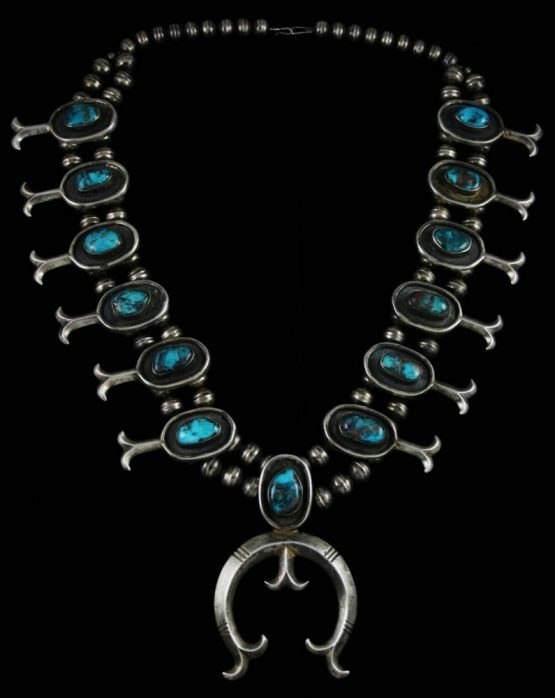 Strung with numerous Royston nuggets, clamshell and five fetishes, this may be the earliest example known of the genre Ã¢â‚¬Å“fetish necklace.Ã¢â‚¬Â In addition two double sided pendants are attached, and were made by inserting chip turquoise in tar, the pendants are set in sterling silver. The attached jacla is perfectly matched Royston, also hand rolled and drilled the jacla is six inches. This piece was made for ceremonial use, no doubt for a prominent medicine chief. This item contains a total of one thousand three hundred and thirty one carats. 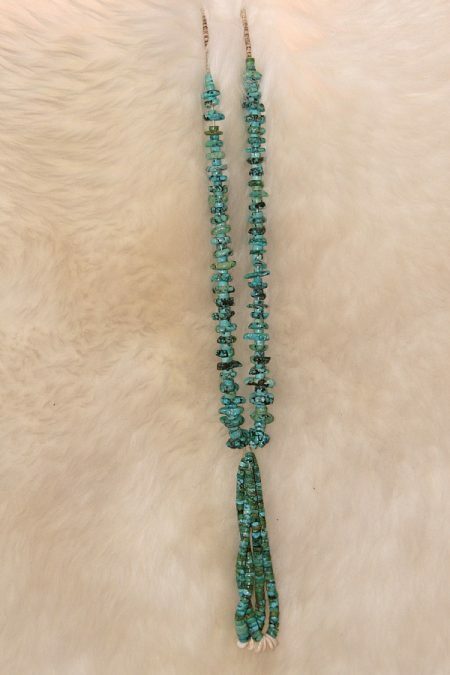 Incredible classic circa 1930 gem grade rare Lone Mountain Spiderweb turquoise necklace with matching rare gem grade Number Eight Spiderweb intermixed. This piece also includes a wonderful matching five inch jacla. 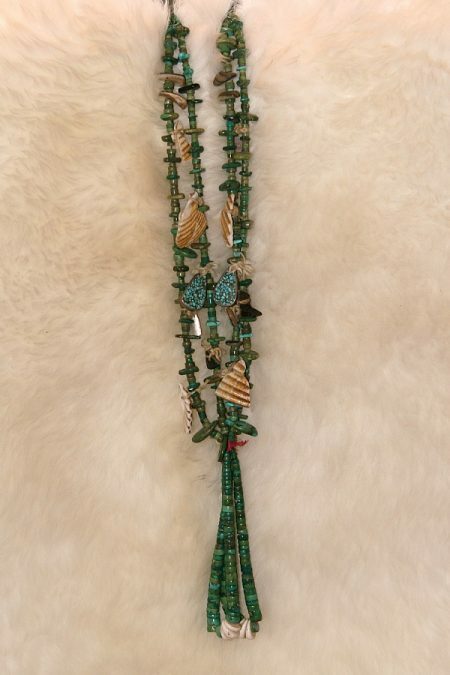 This may be one of the finest historic Lone Mountain necklaces known. This elegant one of a kind piece includes a total of four hundred forty seven carats. 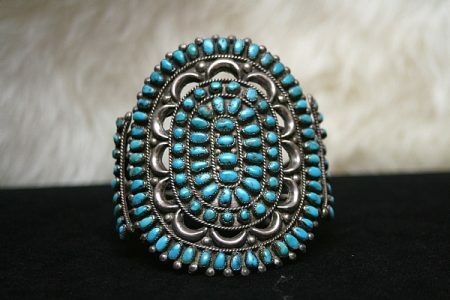 Phenomenal circa 1950 rare gem grade Lone Mountain turquoise pin. 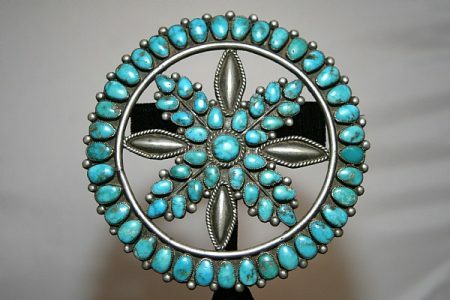 This piece includes thirty six artist cut rare old Lone Mountain turquoise gems set on a wheel design with twenty five Lone Mountain cabochons in an inner flower. The silver work is flawless with classic reposse design elements. Perhaps the finest known of its type. 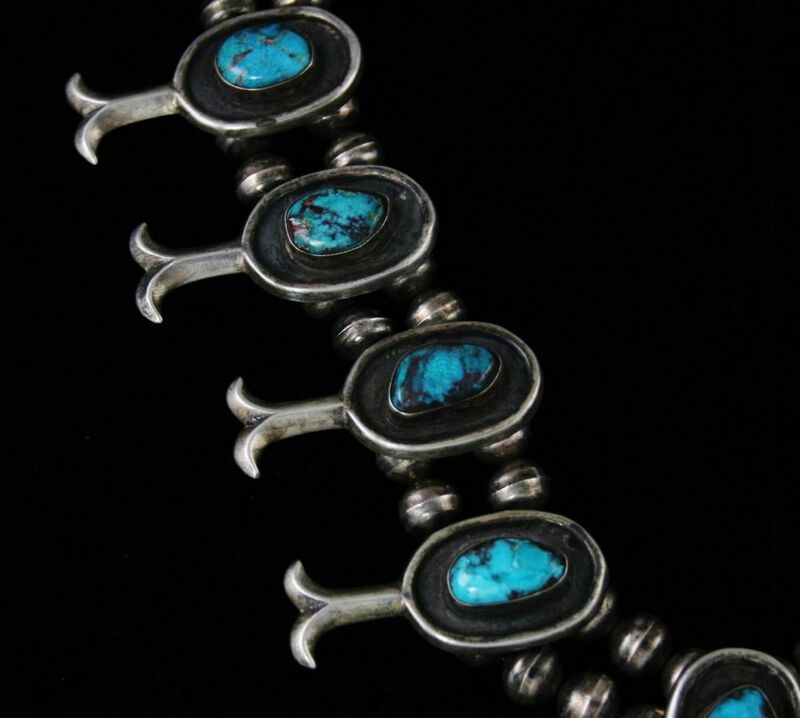 Magnificent circa 1930 Navajo cluster bracelet set with seventy eight artist cut rare gem grade Lone Mountain turquoise cabochons. 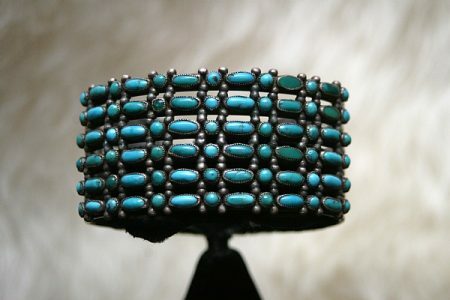 The stones are an eye catching deep blue with dark brown matrix. This ingot bracelet was made from rolled and hammered sterling silver and is one of the finest known. 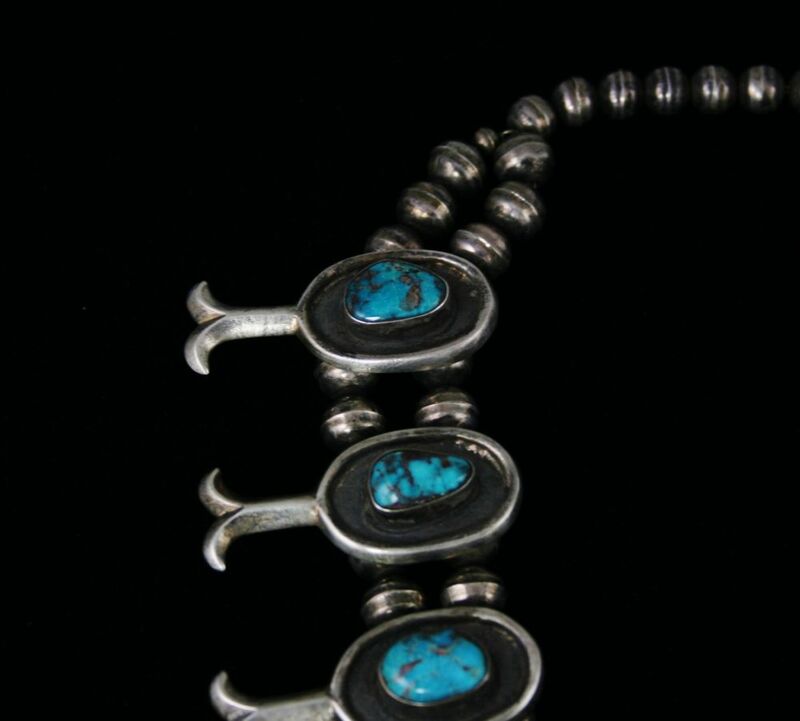 Amazing circa 1950 Navajo cluster rolled and hammered ingot sterling silver bracelet set with fifteen rare high grade artist cut Lone Mountain turquoise cabochons. The stones in this piece are a beautiful light blue with chocolate brown matrix. 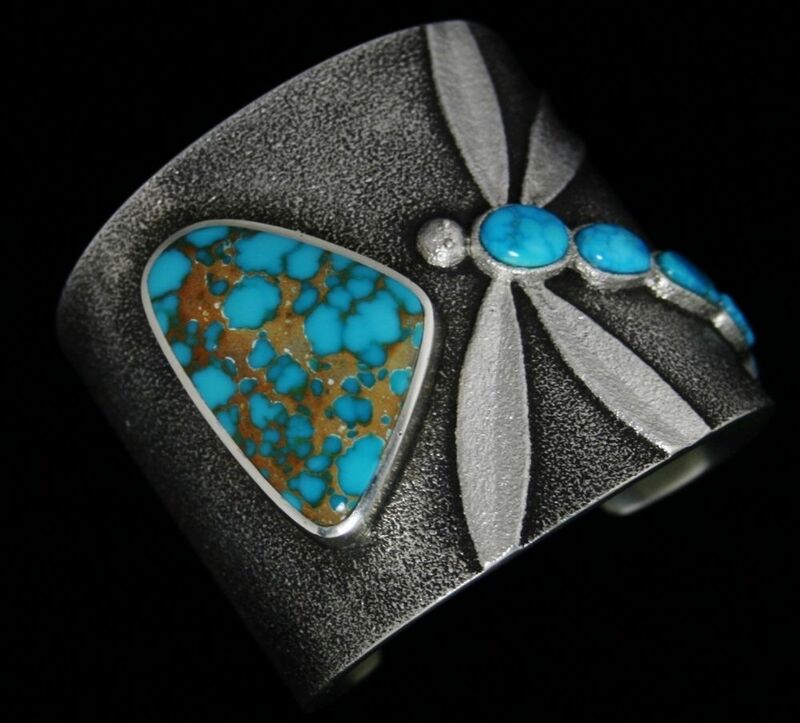 The maker of the piece included hand twisted wire extending the length of the band with sterling silver droplets, arrow designs, and gorgeous stamp work. The original pawn tag is on the back of the item as well. 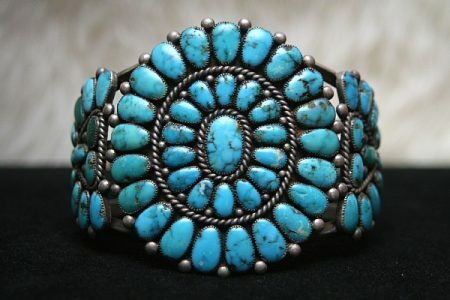 Gorgeous circa 1940 Navajo hand rolled and hammered ingot bracelet with a split band encircling an artist cut gem grade Carico Lake turquoise cabochon. Exceptional detail can be seen in this piece with wonderful designs including an arrow symbol on either side of the band. 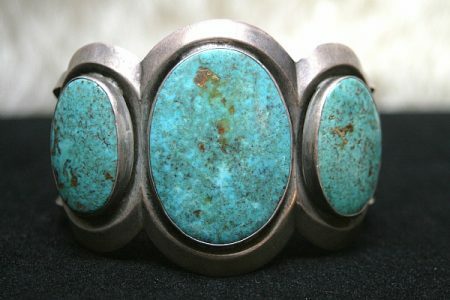 Amazing circa 1930 Navajo sand-cast bracelet set with three high grade Pilot Mountain turquoise cabochons. The stones in this piece are a gorgeous light blue with golden brown and dark blue speckled matrix. 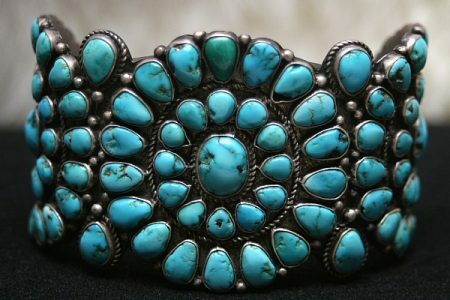 The silver work is superb with a nice heavy gauge and all emphasis given to the beauty of the stone. This piece also includes the original pawn tag on the back. 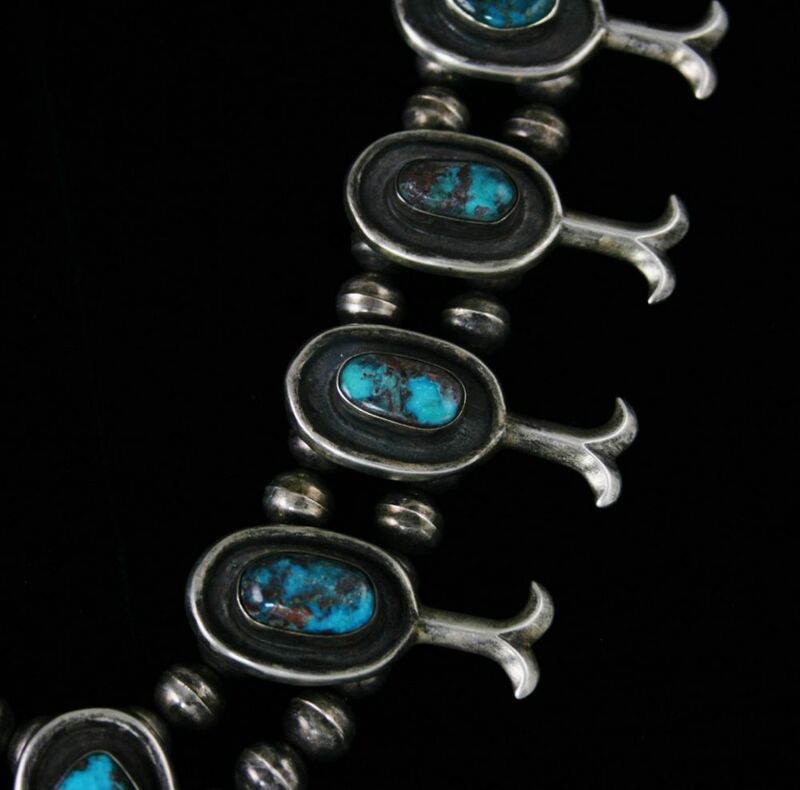 Beautiful circa 1950 Zuni ingot cluster bracelet set with one hundred and five artist cut gem grade rare Lone Mountain turquoise cabochons. 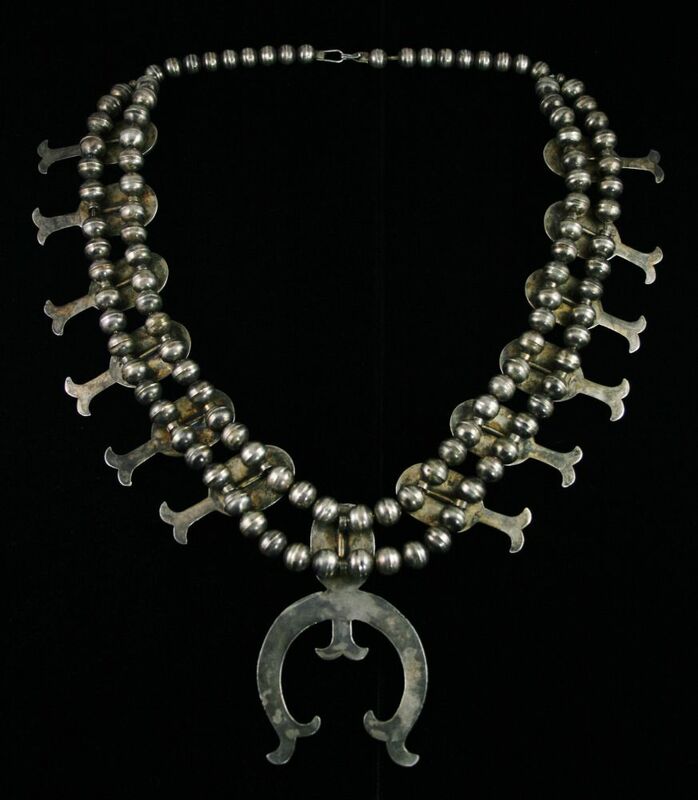 This exceptional piece features intricate silver work and stunning traditional design.